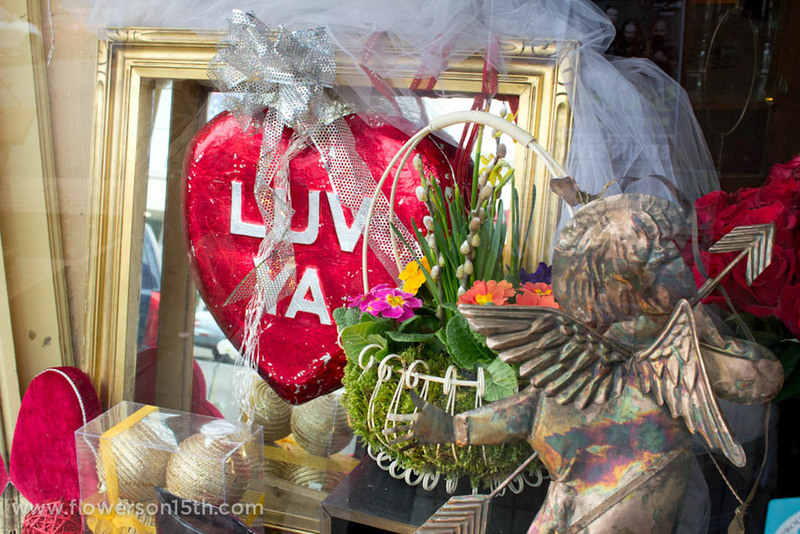 "Valentine’s Day is a busy one for Flowers on 15th. Last year. the line ran out the door and, by the end of it, there wasn’t a single flower or scrap of greenery left in the shop. But nearly every day here is busy — there’s always some occasion in urgent need of floral accompaniment. If you have spent any time on 15th Ave E between Republican and Mercer, you’ve probably seen owner Alex Soto bustling armfuls of flora into his red truck on his way to another of the day’s many deliveries. When I visited the shop on a sunny Monday morning, Soto was busy loading up flowers for the joint memorial service of former Washington Governor John Spellman and his wife, Lois, who died within days of each other at the age of 91 and 90, respectively. Before he hurried out the door, Soto shared the best way to understand his business. “Check out our Yelps,” he said, “That’s who we are. We belong to those people. They love us because we listen to them and we do what they want us to do. The only reason people give us money is because they trust us.”"
Posted on February 19, 2018 by Ricardo Ibarra. We had a fabulous time celebrating our local community at the 15th Avenue Street Festival! The festival was coordinated by our fellow merchant and dear friend Anne Uhlir, owner of Wax On Spa. The event was held on Sunday, September 14 from 2–6 p.m. and featured live music, local artists, and lots of goodies from local merchants. 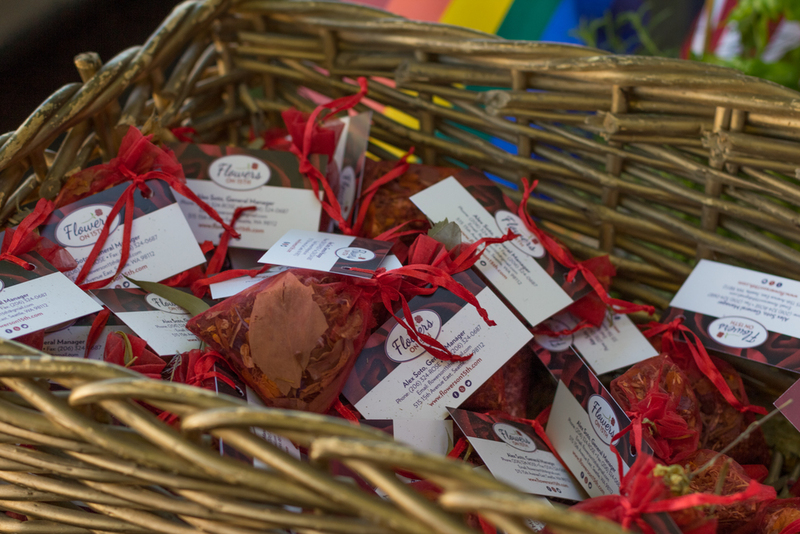 We made rose-scented potpourri sachets and they were a big hit! Photo by Dominic Arenas. View the entire album here. Posted on September 16, 2014 by Ricardo Ibarra. Have you every wanted to give your special someone a rose to say, "thinking of you"? Or maybe you wanted to buy some fresh roses for a coworker or colleague who went out of their way to help you with a difficult task, but don't want to seem like you're interested in more than a friendship? We have compiled the various meaning of rose colors to help you select the right color of rose for the right occasion. You asked for it, so here is our list of the color of roses and their meanings, just in time for Valentine's Day! Red is of course the color of LOVE in all its forms- from girlfriend to fiancee to husband to devoted partner, red has imbued the passion of the blood that beats in our hearts for millenia. 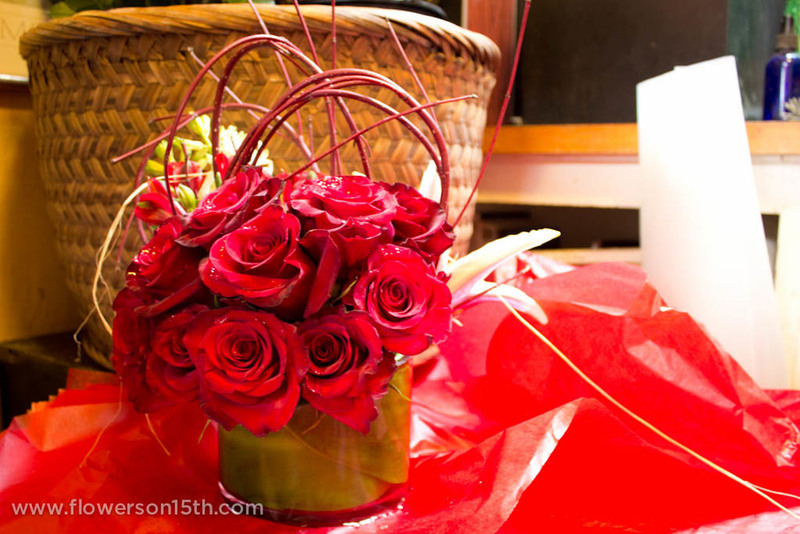 Choose a red rose to show how much love and heartfelt emotion you have for your sweetheart. Have you every met someone who was absolutely beautiful, but didn't realize how stunning they were? Perhaps they were beautiful in a way that was unusual, or unconventional. Maybe they were such a lovely, thoughtful person full of positive energy, that you couldn't help but notice them. These special people deserve a burgundy rose for their unconscious beauty. This color of rose has a special meaning; it signifies enthusiasm and design. This is a perfect rose to give someone you are excited to get to know, or would like to spend time with. It can be a fun, thrilling enthusiasm, or a patient, temperate desire, only you and they will know! Pink is a lovely color in all its shades! This is a fun rose to give, and it's appropriate for many occasions. You could give your grandma a small bunch of pink roses to show her your appreciation, or pass a bouquet to your sweetheart to show them how graceful they are to you. Stormy passion is the meaning of this color of rose! In all it's tempestuousness, a dark red rose signifies burning desire and the volatility of the heart. Roses that are especially dark red have the power to sweep you off your feet, so be careful to whom you give these stunning flowers. This color, more on the deeper side of the pink spectrum, is a lovely and elegant way to express gratitude. Shower a special someone with this color and you'll say, "I'm so thankful for you!" When you present a bouquet of these light, soft pink roses, you signify to the recipient how much you appreciate and admire them. Whether it's their beauty, their wit, or their charms, blush pink roses mean that you hold their possessor in high regard. Bring the color of sunshine to your rose selection when you want to express joy and friendship! Yellow roses evoke sunny afternoons spent laughing with close friends and those dear to us. They are especially lovely when presented as a host or hostess gift. The two most common occasions for white roses are weddings and funerals. Both are celebrations of major life stages, and many are coupled with religious ceremonies. The white rose meanings are purity and peace; their lovely color (or lack of color!) inspires reflection and allows us to focus on the delicate form of the bloom without distraction. These boisterous roses are cheeky and fun! Orange roses are a great way to connect with someone who you enjoy spending time with. Why not send them as a surprise? Or reveal them as part of a puzzle or surprise to really keep that special person guessing. We hope you've found our guide on what the color of roses signifies helpful and inspiring! What's your favorite color of rose? Posted on February 14, 2013 by Ricardo Ibarra and tagged Meaning of Color of Roses Roses What Color of Roses Signifies. Be sure to stop by and pick up a lovely arrangement of fresh red roses for your Valentine's Day flowers!We are SO excited for Valentine's Day! It's been a blessed month and we are just overwhelmed with the joy and excitement you have been bringing into the shop each and every day. Every bucket is filled to the bring with gorgeous fresh flowers from all over the globe to help you tell that special someone how much you care. We have tons of fragrant oriental lilies, fluffy hydrangea blooms, and beautiful orchid sprays in white, pink, purple, yellow, and gold. Of course we have RED roses coming out of every nook and cranny! If the traditional color of love isn't for you, we also have beautiful roses in a delicate lavender color, some very cheeky pink roses, and even sunset orange and lovely white roses. If you'd like to learn more about the color of roses, we'll have that later on today, so check back! A planter filled with spring flowers will bloom again next year!Besides the beautiful fresh flowers, we also have gorgeous blooming plants for you to take home and brighten your table, or your garden! We have azaleas that are just gorgeous- they are covered with bright happy blooms and are livening up the sidewalk outside the store. Spring bulb planters are a great gift that keeps on giving- they will lend the colors of warmer weather indoors, then when they stop blooming, plant them outside for a burst of brightness and fragrance next spring. For the gentlemen or those who aren't fond of flowers, how about a handsome terrarium bowl filled with succulents and mosses from the Northwest? They're very easy to maintain and have a rugged, modern look. Perfect for an office desk or a table in the den or living room. Each of these beauties is hand made by a dear friend locally, and they are going quickly! The shop is full of beautiful flowers of all types and colors for your Valentine's bouquet!Finally, we love wrapping up bouquets of fresh flowers for you to take home to your favorite vase. 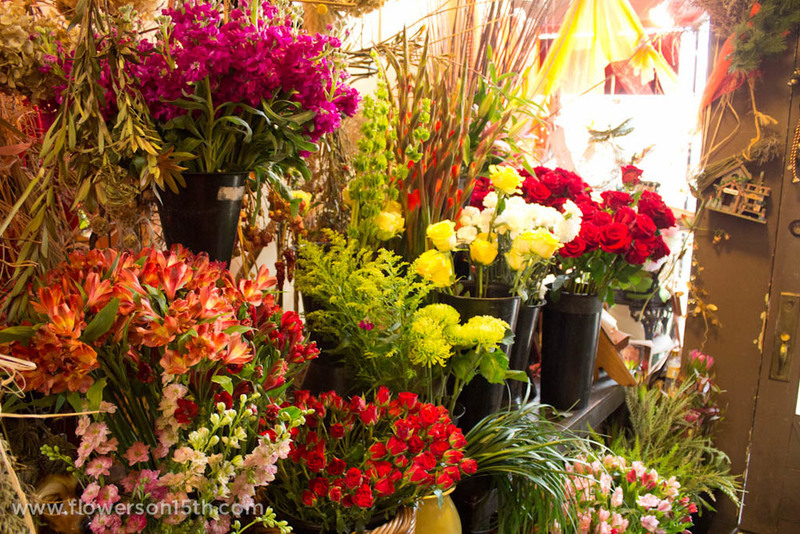 The shop is packed full of beautiful blooms, so come on in, and just browse. When you see something you like, just pick it up and start putting together your own custom creation! Many of our customers love wandering through the sea of flowers to discover something new or an old favorite. For those who aren't that adventurous, we will be happy to help build a bouquet around your favorite flower, complete with greens, wrap, and a satin bow. We just had the most adorable customer in the other day picking out a bunch of flowers for herself- what a Happy Valentine! You can see the photo on our Facebook page. Thank you so much for all your love and support, and Happy Valentine's Day to you from Alex and Carolyn at Flowers on 15th! Posted on February 14, 2013 by Ricardo Ibarra and filed under News and tagged Floral Arrangements Flower Delivery Roses Valentine's Day Flowers. Valentine's Day is just over one week away! We want your Valentine's Day to be special and stress-free, so we've put together your guide to buying Valentines flowers in Seattle. 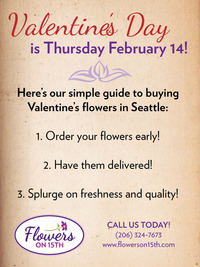 For the best selection, quality, and price, be sure to contact your local Seattle florist early (today, or tomorrow!). Many florists will be extremely busy from February 12-14 and they may not have time to get your sweetheart's favorite bloom from the wholesaler for a good price. If your Valentine has a particular variety of rose or other flower she likes, ordering early from your florist will help them find the best value for you and incorporate that bloom into your gift. Also, because V-day is such a special occasion, many flower warehouses will be limited to stock on hand- so if you are looking for birds of paradise, or a special lily, order early and reap the rewards of a stressless evening. There's something truly magical and romantic about being surprised with flowers during the day. Make his coworkers jealous and send a lovely blooming plant or a gorgeous orchid in a striking modern pot. Choosing flower delivery for your Valentine lets you focus more on the other fun activities you have planned for the day and relax knowing that beautiful gift is on its way! From Ballard to Madrona, we're happy to offer same day flower delivery throughout Seattle. If your recipient is too far away for us, we'd be happy to recommend you to one of our fellow florists in the region or even around the world. Splurge on freshness and quality! Valentine's Day comes just once a year, so why not splurge on a made-to-order fresh floral arrangement that will really knock their socks off?! While you may be tempted to pick up an inexpensive bouquet at the local grocery store, we encourage you to choose a local small business to support! Plus, traditional florists have access to the freshest, most unique flowers every day whereas the vast majority of grocery stores receive their flowers as little as twice a week. When it comes to the holiday of love, you'll notice a difference between a custom florist and a generic offering from a corporation. We'd love to be part of your Valentine's Day celebration! Give us a call today at (206) 324-7673 or send us an email to talk with an expert floral designer about how we can create a stunning arrangement or floral gift for your special day. Posted on February 5, 2013 by Ricardo Ibarra. Flowers on 15th is expanding into the world wide web! Stay tuned as we update our blog weekly with floral care and selection tips, information on the latest flower and landscape design trends, photos of our work, and seasonal ideas. Posted on February 7, 2012 by Ricardo Ibarra and filed under News.